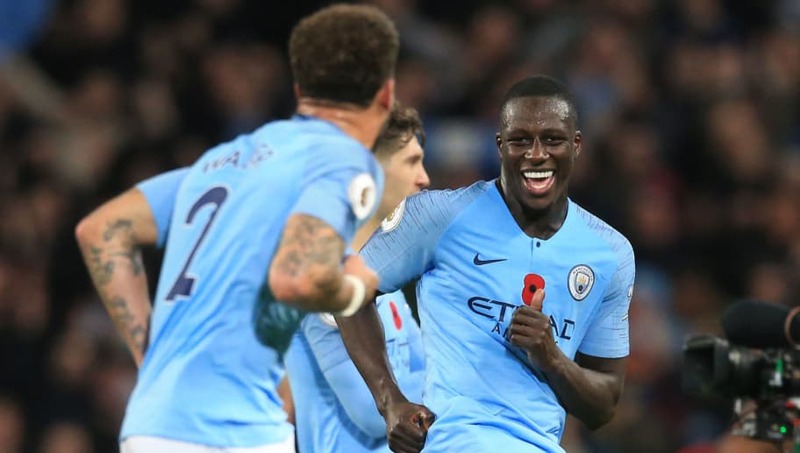 Manchester City defender Kyle Walker has been poking fun at his teammate Benjamin Mendy following the Frenchman's bizarre Instagram post which suggested that he was at an airport in Hong Kong. The former AS Monaco full-back originally posted a picture of himself on his Instagram story with the location set at Barcelona, a trip which had been authorised by Manchester City's manager Pep Guardiola. But he later uploaded a video in a car with the location set as Hong Kong International Airport, something which prompted Guardiola to swear on live television after he was questioned about Mendy's whereabouts in a pre-match press conference. It's been learned that the location was nothing more than a joke from Mendy, but that hasn't stopped City defender Walker joining in on the act of poking fun at his teammate. The former Tottenham star tweeted a picture during training which included the caption: "Where is Mendy?" After the Frenchman responded telling Walker to focus on getting more assists this season, the England international showed off his photoshop skills by tweeting a picture which draws reference on the popular puzzle books, Where's Wally? That could (and probably should) have been the end of their toing and froing, but seldom will Mendy fail to have the last word, and he came back at Walker by tweeting: "Photoshop skills >> football skills". The World Cup-winning defender is currently out of action following knee surgery and he's featured just once for the reigning Premier League champions since November. Guardiola has insisted that Mendy isn't going to be rushed back due to the nature of his injury, but the 24-year-old is expected to return later this month.